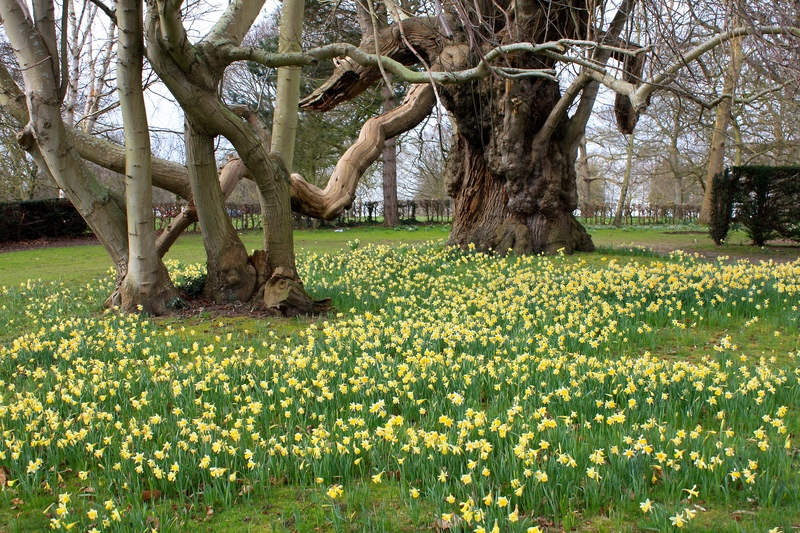 Great gardens to visit in East Kent are rarer than hens’ teeth. Those that open during the winter months even scarcer. So, as soon as Goodnestone Park reopens in spring I am there, with bells on. Well a bobble hat anyway. 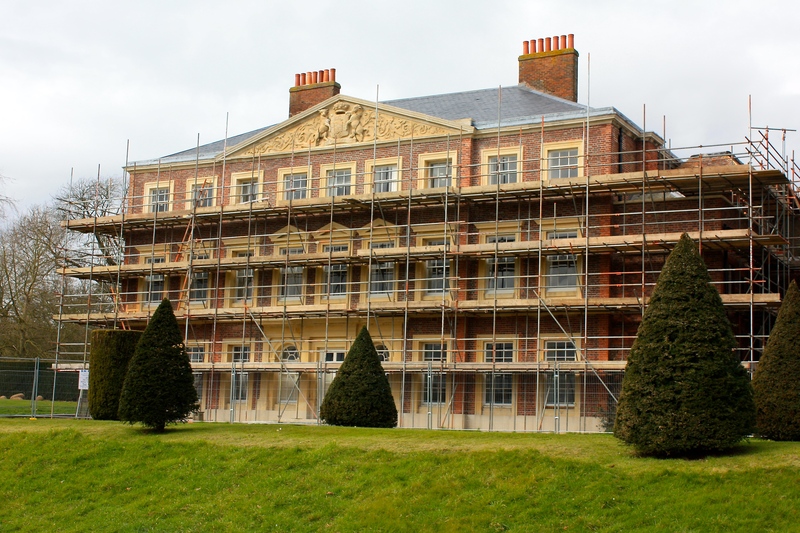 The red brick and sandstone mansion at Goodnestone (correctly pronounced ‘Gunston’), well-beloved of Jane Austen and her brother Edward who married into the family, is undergoing a massive restoration programme. Margaret, Lady Fitzwalter, who made the gardens what they are today, sadly passed away last September at a time when the Palladian mansion was in desperate need of repair. Behind the scaffolding one can see it beginning to look like new again. I was lucky enough to bump into Lady Fitzwalter three or four times in her later years, normally in the garden or collecting entrance fees on quieter days. She was a keen plantswoman and a properly English eccentric, waggling her stick where she wished plants to be positioned and regaling visitors with stories of the great and good that she had known and loved. At Goodnestone Lady Fitzwalter created an unpretentious, timeless English garden that perfectly suited the gentle Kentish landscape in which it lay. It will be fascinating to see what the future holds once the mansion is completed and let as a very grand holiday cottage. From £2500 (I presume for a week, I fear I may be wrong! ), one can now take advantage of the 12 newly refurbished bedrooms and 11 bathrooms, along with a suite of elegant receptions rooms. All provided one has enough wealthy friends to entertain. This weekend the Kent group of the Hardy Plant Society staged a special ‘Snowdrop and Hellebore Extravaganza’ at Goodnestone, complete with attendant specialist nurseries selling choice plants. I always suggest to novice gardeners seeking year-round colour to visit their local nursery at least once a month to see what’s looking good. Although not foolproof, because so many plants can be forced to look their best unusually early or late, it is one way to learn what’s in season and when. This plant fair would have been a great starting point for anyone looking to introduce some early colour into their garden. Madrona Nursery, one of my favourite staging posts en route to Sissinghurst, tempted me with the thorny delights of a 6ft specimen Ribes speciosum. I was about to open my wallet until Him Indoors gave me one of the those “you dare puncture the car’s leather upholstery with your thorny plant” kind of looks. It’s not a good look. I moved quickly on, lest he get too attached to a brightly variegated trachelospermum which made his eyes light up and mine bleed. Next in line was Decoy Nursery, for which I have a very soft spot. Amy Green and James Amery always have special things to offer and Sunday was no exception. I tried to resist, but succumbed to a generous pot of Muscari ‘Baby’s Breath’ and Fatsia japonica ‘Spider’s Web’, which curiously I had mentioned in a post only the day before. Some things are meant to be. Being the lovely people that they are, James and Amy sent me home with a pot of Cyclamen coum (silver leaf form) and two dainty Narcissus cyclamineus to brighten up my greenhouse staging. I knew my luck was in when I spotted a single plant of Tropaeolum pentaphyllum on the Hardy Plant Society stand. It didn’t take me long to part with £5 for the pleasure of owning a plant I have long admired in the yew hedges at Sissinghurst. And from Copton Ash Nursery there was violet-blue Ipheion uniflorum ‘Froyle Mill’ and spiny, exciting Eryngium eburneum. By this stage I was getting carried away and Him Indoors was losing interest (and the use of his extremities) so I reluctantly agreed to come away lest more of the building project budget be blown on plants. At the entrance to the gardens I was sad to see that beds usually packed with hellebores, narcissi and Sarcococca hookeriana var. digyna had been swept away, apparently ready to be replaced by turf. I hoped this was part of a masterplan to rejuvenate this part of the garden rather than an attempt to reduce future maintenance. 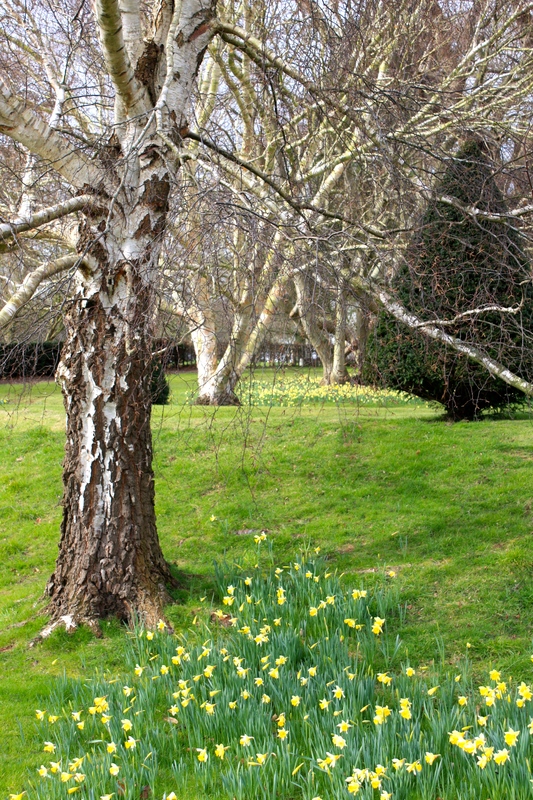 On the other side of the box parterre, venerable birches and sweet chestnuts, their branches flailing wildly in a stiff breeze, conducted an orchestra of lemon yellow narcissi. 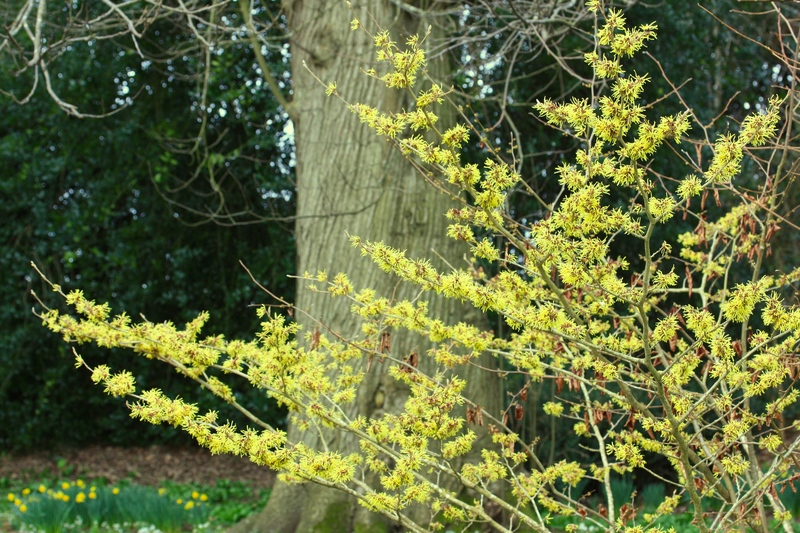 Throughout the woodland garden spring was much in evidence. We were treated to candy-pink camellias, burgundy hellebores (perhaps transplanted from the entrance area?) 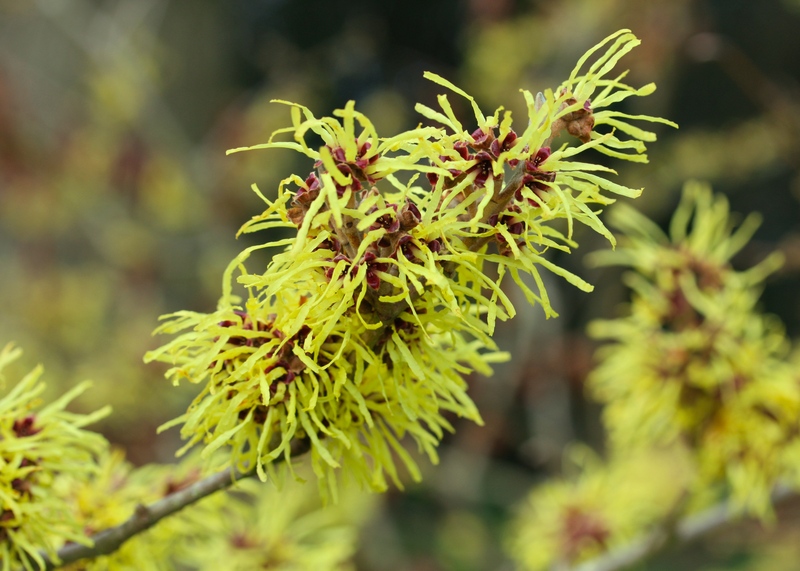 and sulphur-yellow witch hazels. 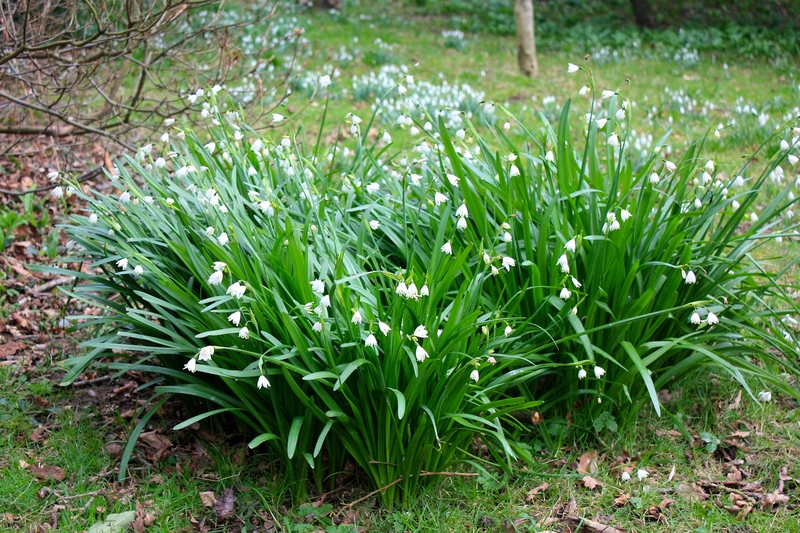 Goodnestone’s snowdrops had already peaked, but the snowflakes, Leucojum aestivum, were in fine form. On a bitterly cold, windy day it was striking just how calm and warm it was in the shelter of the trees. Equally striking was the scent from brooding swathes of sweet box, Sarcococca confusa. It never fails to amaze me that such small, insignificant white flowers can pump out so much honeyed scent. Whilst the woodland garden was very much awakening, the walled gardens slumbered on. A keen eye might have noticed the buds on a pear tree flushing pale pink and lime green, or the blood-red shoots of a peony piercing the earth. Condensation on the greenhouse’s glass was a tell-tale sign that plans were already afoot for colourful displays of annuals and tender perennials this summer. With a changing of the guard at Goodnestone Park one hopes the job Margaret Fitzwalter began when she reclaimed parts of the garden from Christmas tree cultivation in the 1960s will be continued with her own particular brand of verve, vision and vigour. Other posts about Goodnestone Park gardens here, here and here. I’m very sorry to hear of Lady Fitzwalter’s passing, but am pleased to have an update on the garden. I feel in love with this unforgetable place at first sight on a rainy and wild day in September 2012. Sadly, I did not meet the great Lady, though I must admit those with better sense were indoors. Before leaving, I had the best ever tea and cake and gained a watercolor from the gift shop of the Victorian bench. 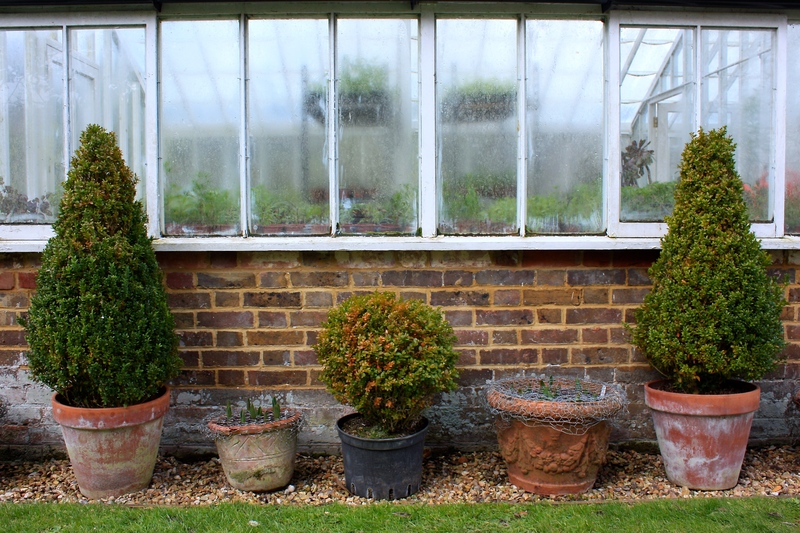 Will the garden remain open when the home is rented? The tea and cake is good isn’t it? Regrettably we only had time for tea on this occasion as it was just before lunch. It seems to be business as usual as far as the gardens are concerned. There’s a full schedule of openings for the year ahead, so I assume anyone renting the house will have to accept the odd garden lover passing by the windows. The gardens never opened on Saturdays anyway because the house was available for weddings. I hope on your next visit that the weather is kinder to you. Hi…lovely to hear about your purchases! Fatsia Spiders Web is taking its time with me, but it is a tough position and made it through the winter, so I live in hope…we don’t have plant fairs here in SW France…I shouldn’t moan, but I do! 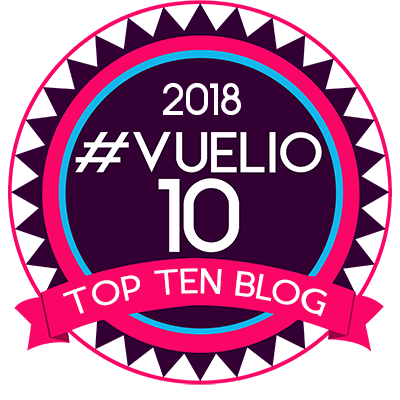 No plant fairs? However do you cope? Do people swap things at the very least? I am going to keep the fatsia in a pot short term until it’s a bit larger. Plants need to be hardened off before I subject them to our ghastly soil! I’ll let you know how we get on. Glad you got some of the plant purchases even if HI curbed some of the spending in favour of unspiked leather car seats and builders bills! Good luck at finishing off the Xmas work then take a break! It will soon be proper Spring and then your garden will be calling for your undivided attention! super photos by the way…and isn’t sweet box just the best fragrance!? Thanks Anne. Fragrance is so welcome and precious at this time of year, as is every single bloom. Christmas almost signed off now, so am looking forward to a nice restful weekend. I think we live parallel lives Tina. I get a of ‘why can’t we have more flowery things like these?’ (pointing at stuff which needs dry, hot conditions which we don’t have) and, always when I am half way around the world somewhere, ‘I’ve been out in the garden chopping’, which guarantees a sleepless night. After much protestation I gave Him Indoors jurisdiction over the vegetable garden, but his interest in it is sporadic, shall we say. Have a lovely weekend. We were in England last year in September and stayed at a lovely B’n’B near Goodnestone Park. Our host called to check on the hours and found out that Lady Fitzwalter had died just two days earlier. Sad news all around. On a happier note I will check out your posts on Goodnestone Park and get to see what we missed. I love coming on your shopping trips with you, good choices, no eye rolling from me 🙂 Goodnestone looks beautiful, thanks for sharing.